Community groups and immigration activists continue their push to get the U.S. House of Representatives to vote on immigration reform , and now there’s a group, Republicans for Immigration Reform, that’s rolling out a new web ad to get legislators from their own party to get behind a vote on the House floor. The group is headed by former Commerce Secretary Carlos Gutiérrez, who served in the George W. Bush administration, and who has said that at the very least it makes a lot of business sense to pass an immigration reform bill — especially if the GOP wants any kind of support from Latino voters. Meanwhile, activists continue to lobby non-stop. 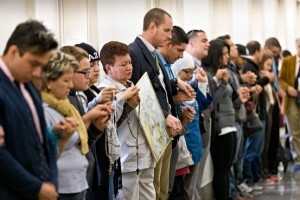 A group from Arizona was recently in Washington, praying outside congressional offices.